Nokia's first super-sized handset just weeks away? We may be treated to the first phablet from the Finnish firm before the month is out as word of a Nokia Lumia 1520 release date gets out. The slip was made via the @evleaks twitter account - a highly rated source of mobile leaks - with a simple message "Nokia Lumia 1520: launches 9/26." Nokia is yet to reveal whether or not it is indeed working on the rumoured 6-inch Lumia 1520, which is thought to have been codenamed Bandit, but that hasn't stopped the rumour mill going into overdrive. We've seen various specifications and pictures claiming to reveal the Lumia 1520 from a variety of sources and they all seem to be banging the same drum. 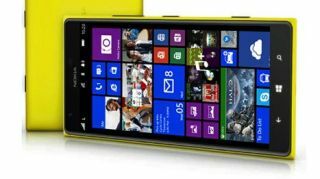 It's being suggested that the Lumia 1520 will be the first Windows Phone handset to pack a full HD display, and Nokia could well break into a new screen size if the 6-inch reports turn out to be true. While its name may be similar to the 41MP toting Lumia 1020, the Lumia 1520 is said to arrive with a less brash 20MP snapper as well as a quad-core processor (another Windows Phone first) and the same polycarbonate design we've become accustomed to with Nokia. There's apparently an update in the pipeline for Windows Phone 8 too, version 8.1, which the Lumia 1020 is hotly tipped to run out of the box. Now we're not getting too carried away just yet, as nothing is set in stone and Nokia hasn't shown any signs that such a handset is in production. We'll just have to sit tight for two weeks.